The following commentary is from the EWTN series, The Papacy: A Living History, The Papal Artifacts Collection of Father Richard Kunst. It is from the second episode of Season 2: The Canonization of Pope John XXIII. A DVD of Season 2 will be available from EWTN in 2015. The commentary provided here is a compilation of the conversation between Father Richard Kunst, the Papal Artifacts’ Expert, and his co-host, Father Ryan Moravitz. There are a lot of different things in my Collection, from old souvenirs that you buy in Rome from two or three hundred years ago, to documents that were owned and signed by popes. But I’m very partial to clothing items, things that the popes wore, and I often say this: the popes don’t have rummage sales. And so how to obtain clothing items worn by them? Well, you can do it in various ways, even sometimes back-handed ways. We know that one of the traditions that Pope Francis engages in is “swapping zucchettos”. 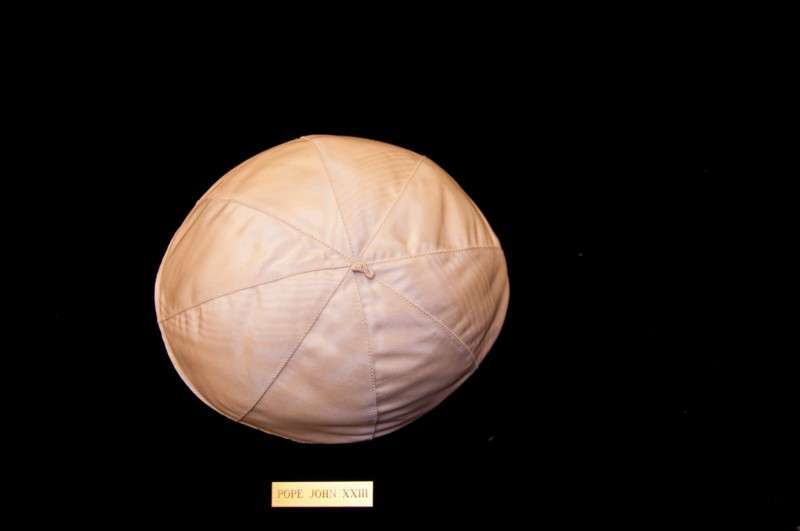 You can go to Gammarelli’s, which is the papal clothing store, the famous tailor for the popes, and you can buy a zucchetto—there’s only one size in the white ones—and, if you’re lucky, you may be able to “swap zucchettos” with the pope. She had a cousin, a nun, working at the Vatican, taking care of laundry for the Pope. So this actually came through that nun. There was no “swapping” for John XXIII’s, but this cousin was able to get this and another pope’s, Paul VI. So I got two zucchettos of those popes from this doctor and her cousin. She just sent them to me as a gift, because she didn’t know what else to do with them. The Church is so huge; it’s universal; it’s everywhere. It’s so large and yet, it’s so small. When you hear a story like this, you know it’s one little connection to the next, and a story like this brings the Church to a human level that gives us comfort as members of the Church, especially with clothing items. There’s the divine element and the human element as well. Really the white zucchetto symbolizes for us, the pope; and the red symbolizes the College of Cardinals. He was a humorous and humble man. Another one of his famous lines was someone once asked him how many people worked in the Vatican, and he said, “Oh! About half of them!” So yes, he had a lot of those one-liners. This was a very joy-filled man, and to think that I have something right here in our midst that he wore. Saint John XXIII wore this on his head. Who knows for how long? He wore it on his head as a symbol of his priesthood, because priests can wear these. Originally they were meant for priests when they were created in the 13th century. But later on in history the different colors came to denote different ranks. And John XXIII, Angelo Roncalli, the priest wore this. Kind of awesome to have this in our presence. I don’t know if you’ve ever had the opportunity, Father Ryan, to say Mass at his tomb at Saint Peter’s. When he was beatified, they actually brought his body up and you could see it. The year he was beatified I was blessed to be able to say Mass there. And the reason why he is in that particular altar is because when he was a priest and a bishop in Rome that was his favorite altar to say Mass on because of the mosaic behind it: “The Final Communion of Saint Jerome.” He was very partial to it, and providentially, they were able to put his body, then beatified, and now canonized, in his favorite altar. They say when he was beatified and they brought the body upstairs, there was a miraculous component because of the incorrupt aspect of his body. And they say that lines were out the door of Saint Peter’s for well over a year to see him and to pray at the tomb of his mortal remains. The Holy See doesn’t really call this incorrupt body a miracle because there are not enough years yet to have passed, and popes are embalmed and buried in three different coffins. So maybe in a hundred years if he is still incorrupt, they’ll call it a miracle. But the biggest thing is the devotion of the people. He really was dear to them, especially the Italians. When he died, there was a headline in the news in Italy: “A Death in the Family.” And people all over the world felt that way because of his grandfatherly ways. Do you know his nick name? The Good Pope John. It was first adopted to keep the tonsured (shaved heads) of clergy warm in damp, cold churches but it has survived to the present day.